The morning started with a trip into Old Town to pick up some shoes we’d all had custom-made the night before for about $20 a pair. We also had to duck down to the markets to find a waterproof bag large enough to fit the three suits that we now had to strap to the back of our bikes for the next 1000+ kilometres. I stayed with the bikes at the entrance to Old Town and grabbed a couple more photos while the other two grabbed the shoes. By about 9am we were all loaded up and on our way heading south down Hwy 1A again looking for the turnoff to Hwy 14E that would get us back on to the HCM Trail. Now I must mention to anyone following this trip that Hwy 14E is not nearly as big as it appears on the map. 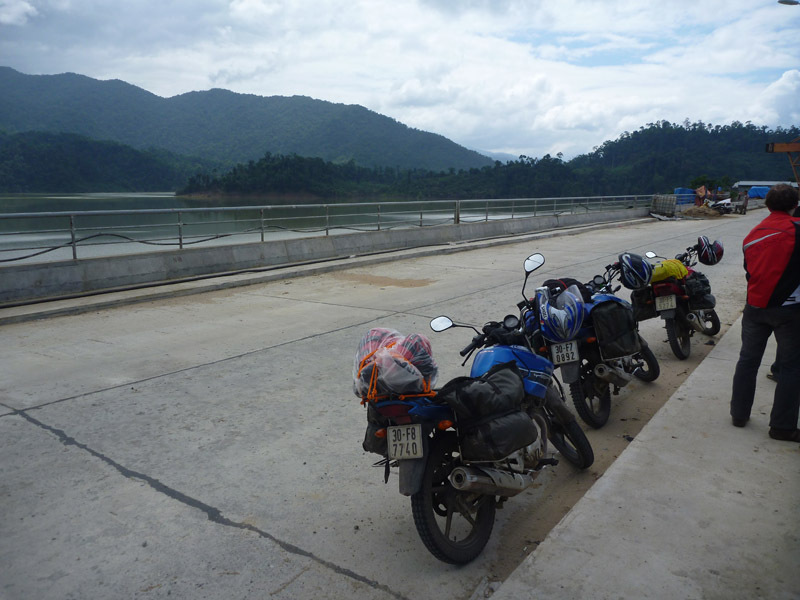 We were expecting something similar to Hwy 1 and hoping for something similar to HCM Trail but instead found ourselves on a pot holed single lane road that we had to share with the locals drying their crops on the only hard flat surface they had. We even stopped a couple of times to check that we were in fact still on the right road and heading in the right direction. 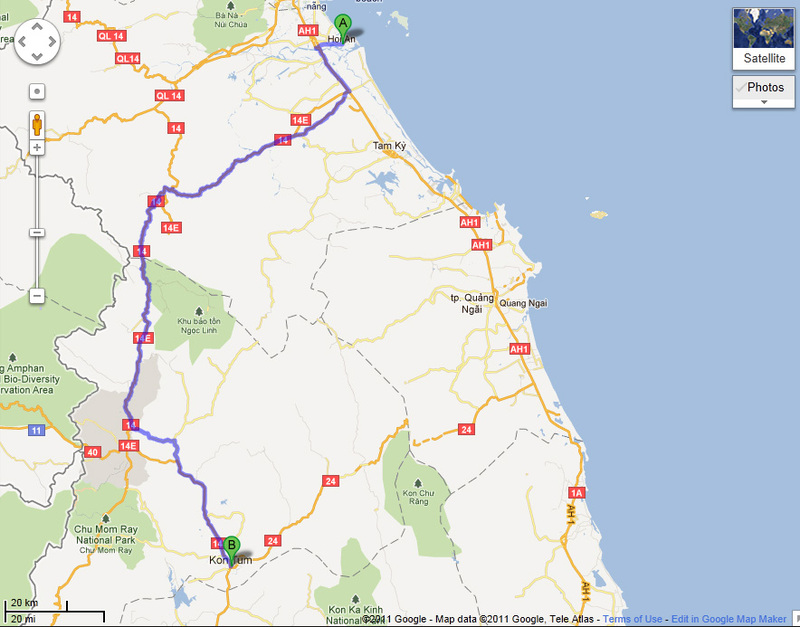 Average speed along here would have been 35-40kms so it immediately put us behind schedule for the morning. About an hour in the road started to become covered with mud so it was clear some major construction was going on somewhere up ahead. As we rounded a bend we were confronted with the construction of a huge new dam and hydroelectric power station. Work was progressing along at break neck speed with the only 4 guys on the site all laying in hammocks under a makeshift shelter. As we hopped off the bikes and walked up for a closer look we received little more than a polite hello and they allowed us to continue on to the edge of the construction site (something we’d have never been allowed to get within 100 yards of back home). As we continued on heading west we would come across multiple dams of different sizes. 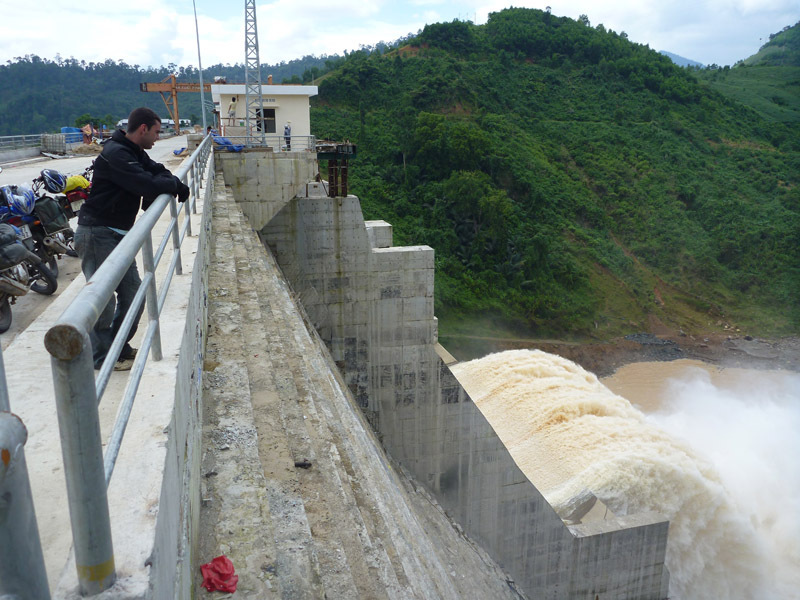 It seems to be a very popular means of power generation in this area and given the recent rains there was a huge excess of water so most of the dams had their flood gates open. Once back on HCM Trail the roads were back to what we had grown to love. Relatively new twin lane roads with minimal traffic. We also found ourselves winding back up and down through the mountains with plenty of scenery to admire along the way. It was also a great day for opportunities to get into the panorama photography that I enjoy so much. A couple of the stitched panoramas are below. As we followed this river along the side of the highway we came to another amazing suspension bridge across it. This time it was longer, skinnier and far older than the previous ones we’d come across. The locals seemed to be a little more wary of this one and would only cross one at a time. Having taken a quick walk out to the middle I completely understand why. Many of the planks had either snapped or had worn down to a few millimetres thick so it was only a matter of time before someone went through. As such I chickened out on taking the bike out on this one and stuck to solid ground. We hung around for a while here watching a few of the locals deftly navigate their way across the bridge before deciding to move on. The afternoon of riding through the mountains would be the first time we’d hit rain all trip. Even then, it only lasted about 10 minutes (long enough to get us soaked). The mist and low-level cloud that came with it however prevented me from taking too many photos so I haven’t got much to show for the last 80km’s into Kon Tum. This stretch of road is the closest you come to the Laos border and I’m sure on a clear day you could easily see it from the road. 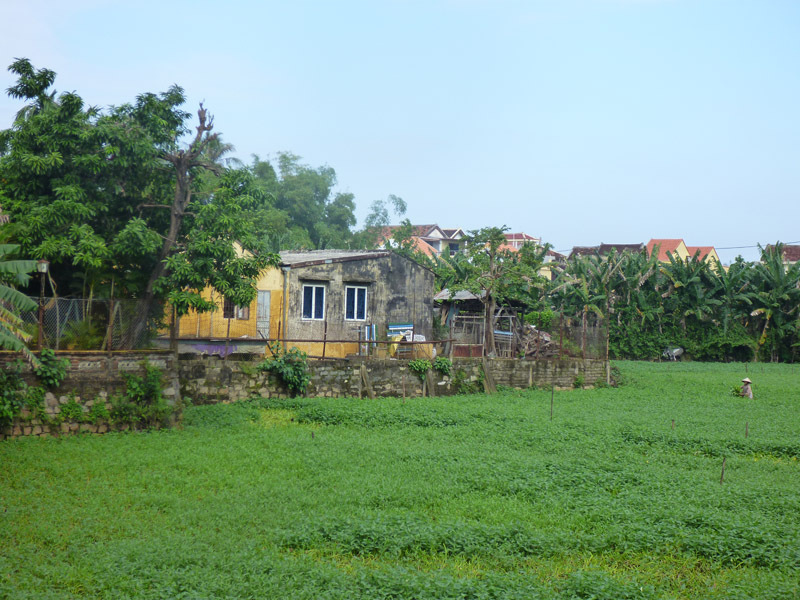 We arrived into Kon Tum at about 4:30pm and I was honestly disappointed with what we found. From the brief bit of information I’d read on Kon Tum I was expecting it to be some small hilltop village with plenty of culture. Instead we rode into what can only be described as a fairly large, modern and somewhat bland city. 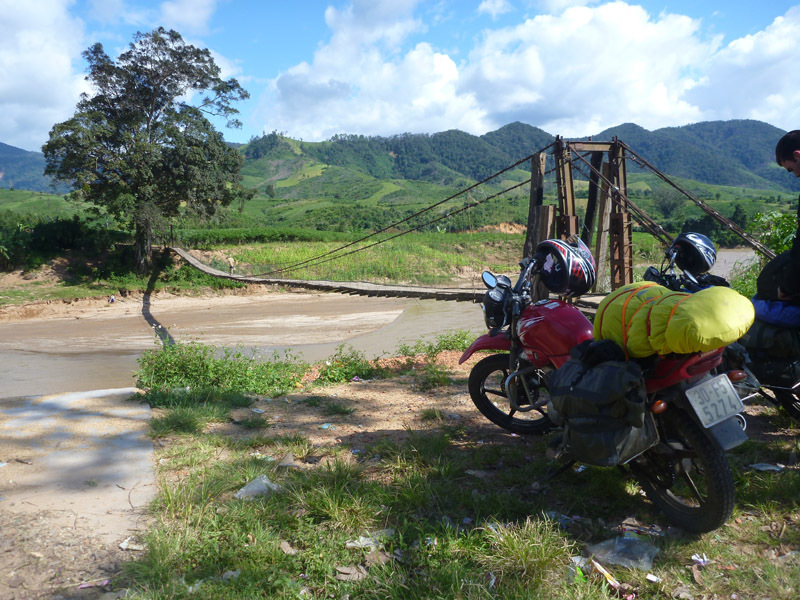 I feel we’d probably been spoilt by what we saw in the North and it’s not to say there aren’t some nice areas around Kon Tum (as plenty of people would later suggest) just that we didn’t see them on our fleeting visit through. We found our way to the back streets and a small hotel that lonely planet had recommended and other than stepping out for a quick bite to eat and a wander around, we didn’t get up to too much for the evening.